It’s a new year, and it’s time for a new experiment here at RetroPhaseShift. Rather than trying to cover the news and compete with huge sites that can get exclusive interviews and all kinds of things I won’t be able to provide, I’d like to gather up some of these important news stories that you might have missed for a weekly post. This will include things like casting notices, location filming announcements, the releases of plot synopses for various episodes or films, trailers or teasers, and even smaller things like episode titles or rumors floating around. If I think it can give some insight into an upcoming or ongoing series or movie, it’s valid. On the other hand, I’ll try to keep spoiler-y things either to their own section or left out entirely; I’m not looking to help spread leaks unless they’re so controversial that I feel the need to comment on them directly. After all, there’s plenty of discussion-worthy information to be gleaned from little things without needing a leak to spur it on. Ideally, I’ll leave you with a little window into the production-side of your favorite shows and spark a little excitement for their upcoming seasons or releases. With that said, on to the news roundup! Let’s start with everything Marvel. The first Ant-Man teaser-trailer (well, if you don’t count the ant-sized one) dropped during the series premiere of Agent Carter. It’s given our first glimpses at the world of this film and how it’ll slot in with the Marvel Cinematic Universe at large. You can watch it on YouTube here. Personally, it seemed rather underwhelming; nothing here really gives us a look at the heart of the film, the way that the Guardians trailer did. Relatedly, the second Avengers Age of Ultron trailer should be released in three days. What’ll be in it? Vision? The Twins? Who knows! An unexpected turn in that the Marvel Cinematic Universe Netflix series Daredevil will be deployed worldwide on April 10. I wasn’t expecting to see this until after Age of Ultron, so it’s a pleasant surprise to get it early. Perhaps some crossover in the last few episodes of Agents of S.H.I.E.L.D.? In other Marvel news, Edward James Olmos (better known to many of you as Bill Adama from Battlestar Galactica) will be making an appearance on Agents of S.H.I.E.L.D. in the back half of the season. No word yet on what Olmos’ role will be, or if it’s a recurring one, but I’d say odds are good we’ll see him more than once. Concept art of a new ship design from Star Wars Episode VII: The Force Awakens has been leaked. All kinds of speculation abounds, but the ships look cool and what more can you ask for from Star Wars, really? The first Star Wars spinoff film, set for a 2016 release, has let go of its writer as well. Much like Edgar Wright’s contributions to Ant-Man, the existing work will probably still influence the final film, but there’s no telling exactly what this means yet. Scarlett Johansson has been cast in the lead role for a Hollywood adaptation of the classic Cyberpunk Anime Ghost in the Shell. Color me unimpressed. Hollywood has a notoriously bad history with anime adaptations and I’m not convinced Johansson has the presence that Motoko requires. I guess all there is to do now is wait and see if it actually gets made. A new trailer for Chappie, the latest from Neil Blomkamp (District 9, Elysium), has debuted and can be watched here. It gives a much clearer idea of what the movie’s tone will be. Kinda Cyberpunk. I like it. There’s a rumor that Batman Vs. Superman may be split into two parts. Having been apprehensive about the film already, I’m finding this, if it’s true, to be a bad sign. Fox’s Minority Report TV series has been ordered to pilot. Does this really need to exist? I love the movie, but… ugh. I feel like they’re going to miss the point. We’ll see. Syfy Channel’s 12 Monkeys adaptation will start airing next week, January 16, at 9 PM. I’m not the least bit interested in it, but maybe you are. 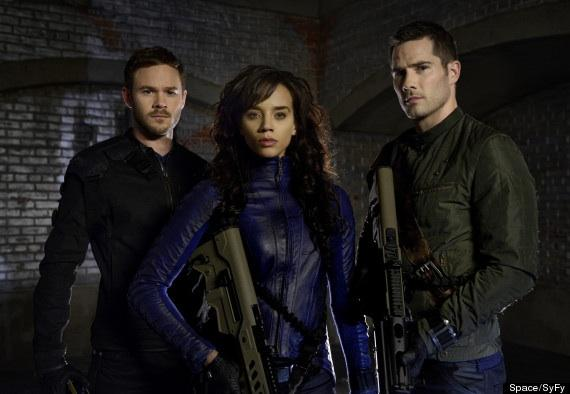 Last but not least, the upcoming Syfy show Killjoys (source of the image above) finally has a solid premiere window, set for this coming summer 2015 (alongside Defiance season 3, perhaps?). There hasn’t been much news about the show so far, but knowing that it’s moving along at a good rate for a summer release should help ease the wait.